If you’re anything like me the simple task of taking your dog out for a walk can be quite a challenge. Over the past couple years we’ve made a lot of progress following these steps. I’ll admit it’s it’s not perfect, there’s always going to be unpredictable circumstances, but it’s made a huge difference. I just need to start out by saying I sympathize with your situation. Being the owner of a reactive dog myself I understand how stressful something as “simple” as a walk can be. Walking your reactive dog isn’t always a nice or relaxing experience, but there are ways to make it easier. Unfortunately for us reactive dog owners we’ve had to put so much effort into avoiding situations that might set our dogs off we’re often tired and stressed out before the walk even begins. It’s tedious, and the bubble we create for our dogs can leave us feeling anxious. But trust me when I say you’re not alone; there are a lot of owners struggling with the same thing. Reactive dogs can be hard to manage. When you get looks from strangers wondering “why can’t she control her dog?” it’s a pretty disheartening feeling. Trust me – we’re working on it. You need to be able to move past the fact that you’re going to get dirty looks. 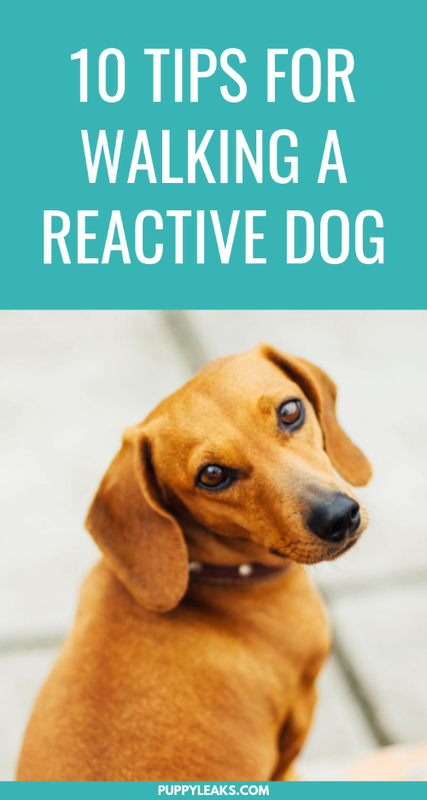 People that have never owned a reactive dog can be clueless when it comes to the time and effort required to treat reactivity. It’ is embarrassing – but in order to make progress you’ve got to get out there and work on it. Ignore the dirty looks and remember you’re doing this for your dogs well being – not for your neighbors approval. Owning a reactive dog is a liability. 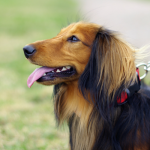 If you aren’t able to control your dog on a walk you should seek out a professional trainer or behaviorist. 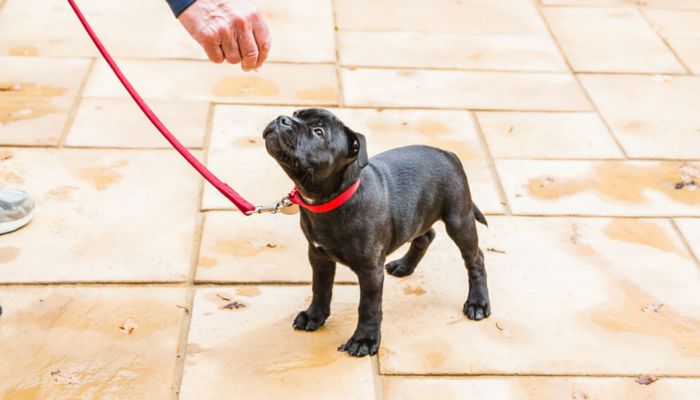 They can help teach you how to manage your dog, and it’s done in a controlled environment. The best piece of advice I can give when it comes to walking your reactive dog is to stick with it. Whether you only make it a block or 10 miles in a day doesn’t matter. If you have many bad experiences because you’re moving too fast for the dog you’ll end up back at the beginning. Start out slow and find out which techniques work best for walking your dog. Once you’ve got a decent technique it’s then time to gradually increase their exposure. Desensitization is a long process; training your dog to walk without incident is something you build on. Unfortunately there is no perfect formula or overnight trick to guarantee a great, uneventful walk for you and your reactive dog. There’s a few tricks and techniques you can try; they’ve all helped Laika to varying degrees. Letting your dog know that good things happen when they get close to their trigger is what’s worked best for Laika. Remember that your dog is under stress when she’s being reactive, try and communicate to them that nothing bad is going to happen. It’s accomplished easily with their favorite treat and your handy dog clicker. For Laika I make sure we have some carrots or snap peas on hand. I know I’ve gotten too close when she immediately spits them out and stays focused on the approaching person, dog, bike etc. When this happens we turn back around and go back to finding her comfort threshold. The threshold is the point at which she isn’t exhibiting any signs of stress. Don’t be afraid to overpraise; if your dog is remaining calm while in the sights of another dog feed her treats like crazy and praise often. I’d recommend watching this great video by Kikopup who demonstrates calming behaviors you can practice when walking with your reactive dog. Your dog needs to believe that other dogs (or whatever things they’re reactive towards) being around equals great things happening. But remember: training your reactive dog is by no means a quick and easy process. 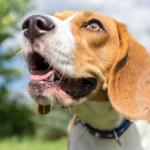 Teaching your dog that new things are no big deal sounds easy enough, but being able to actually implement it enough times with your dog to see tangible results will take time. If you remain consistent with the praise, clicks, and treats while your dog is nearing their threshold (but not over it) you’ll eventually begin to see a difference in their emotional response. Their reactivity may not ever be completely gone but you can learn a lot about their specific boundaries by constantly practicing this technique. 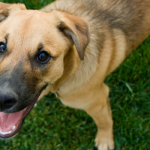 Another popular way to train your reactive dog to walk is by using choice training. That method means you praise your dog whenever they make the choice to remain calm and well behaved in a stressful situation. It relies on catching behaviors you like and praising them for the choices they’ve made, thereby motivating them to make those same good decisions in the future. If your dog becomes overly aroused it means you pushed too far, too fast. Simply back up a few more feet next time and start again. It takes a lot of time to desensitize a dog to their stressors, so don’t become discouraged if it doesn’t work the first time. Failure is always going to be a part of training, but it also helps us learn to improvise. I failed yesterday when I decided Laika and I should go meet some horses. Lesson learned; my reactive dog doesn’t like horses. Incorporate something unpredictable and fun into your walk. Change your pace, switch directions. Praise your dog as they follow your lead. I bring a tug toy along on walks. It’s a nice quick way to hold Laika’s attention & keep her focused on me. This will help build their interest in what you’re doing rather then focusing on what may possibly lie ahead. If your dog doesn’t give you a lot of attention on your walks this is a great exercise to gain their interest and focus, it’ll also make your future training sessions easier. If your dog has a hard time staying focused on walks be sure to check out How to Increase Your Dogs Focus & Impulse Control. Teach your dog to touch or target you with a specific cue. For Laika I use the very original phrase “touch” as I put out my right hand. When I see something up ahead that I’d like to avoid I’ll start to walk backwards and say “touch.” Laika may not know why I’m suddenly walking backwards, but she gladly turns around and comes running back to me. And of course she’s rewarded handsomely. I can then decide how best to handle the upcoming dog while I’ve got her full attention. If you ever find yourself unsure about a certain situation just avoid it. 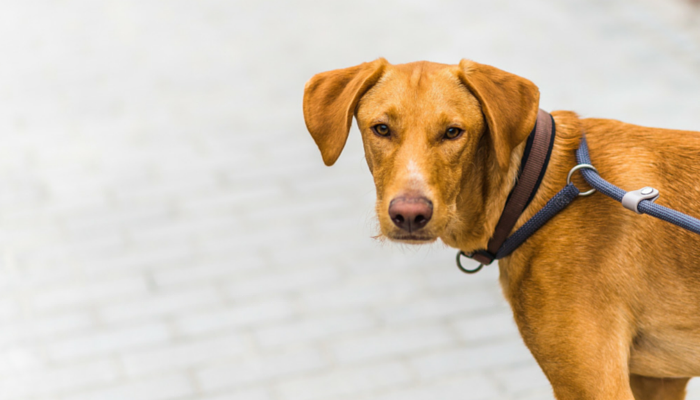 As the owner of a reactive dog you’re going to learn that certain situations aren’t worth the effort – especially if you’re not sure you can manage your dog. Avoidance is just a way to keep things under control when you’re not feeling confident about confronting the situation. Safety should always be on your mind when you’re walking a reactive dog; if you don’t feel like you can handle the situation it’s best to avoid it. As soon as you see a potential trigger for your reactive dog you can choose to walk the other way. You can also use things such as parked cars or bushes to create a barrier between your dog and the trigger. You can also just sit and tell your dog to stay until the other dog has passed. Not all battles are worth fighting. One of my favorite tips for managing my dog’s reactivity on walks is to bring a friend along. If you’re not confident in your ability to maintain control while walking your reactive dog having another person around can do wonders for your confidence. The other person can help keep your dog interested in the walk itself, especially if they’re carrying some yummy treats. Managing a reactive dog is challenging, so don’t be afraid to reach out for help. 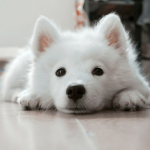 When I first got Laika I had no idea what to do; I’d never had to deal with leash reactivity and resource guarding, so I reached out to a dog behaviorist for help. I can’t even begin to tell you how much it helped. For me having someone that could give me actionable steps to make things better was invaluable. I learned so much and gained confidence in my own ability to manage my dog. And when it comes to managing reactivity having someone outline small steps you can take makes a world of difference. I recommend using a backpack or front clip harness for any dog because they’re great at teaching a dog to walk nicely on leash. If you’ve ever had problems getting your dog to walk calmly a good backpack or harness can work wonders. When I use a backpack on my own reactive dog her focus changes. She’s not interested in the squirrel a mile away or all those crazy car noises. She becomes attentive to me and focuses on the job at hand – walking. The same goes for a proper harness. To keep your dog from pulling buy a harness that clips in the front; when you use a back clip harness it’s actually encouraging your dog to pull more. Remember to keep up the praise & treats when your dog does well. It helps enforce the fact that they’ve made a good choice. It’s embarrassing and frustrating to walk a reactive dog, but it can get better. With dog training as with many other things you get what you put in, and one size doesn’t fit all. Not all techniques will work for you and your dog. Find the tricks that work best to keep your dog calm and relaxed on walks. With enough quality training you’ll find that you’ve got yourself a much closer bond with your dog and not to mention a more relaxed walking buddy. Once you start to see improvements you’ll notice that you’re able to focus more on the walk, rather than the reactive dog at your side. Eventually you might even find yourself able to take a deep breath, relax, and enjoy the scenery. Good calm advice – for when we’re not feeling calm at all! You’re so right that a much closer bond forms between you and your challenging dog. You can celebrate small steps forward – which gradually become huge advances. It’s really hard to say what the exact correct method(s) would be for making things better with Moose since it sounds like you have multiple issues that you’d like to address. As for the suddenly jumping at people that is scary, and unfortunately it’s something that isn’t easily forgotten and can lead to walks being a lot more stressful. I think you did the right thing by politely telling people about him before they approach. I often say “my dog doesn’t have good leash manners” and most people seem to understand. I’d consider reaching out to another behaviorist, but maybe see if you can get a consultation first and explain what you need addressed & see if they’d be willing to work with you rather than just give you an explanation with no real solutions. It’s likely going to take a lot of counter conditioning to the things that trigger him which can be a lengthy process. The ultimate goal is to turn those situations that he finds scary & overwhelming (such as someone getting too close) into positive associations. Good tips I especially liked the “touch” technique. My rescue dog is 17 months old and is afraid of kids, people often don’t realize she’s not “nasty” but just a dog that needs her own space. I got some comments like all dogs should love kids. So I praise her like crazy whenever she doesn’t run away from a bus (I live in Paris) a kid with a soccer ball ^^. I’ll try the touch technique so she focuses on me rather than on what frightens her. Jen, another great post!!! THANK YOU SO MUCH.